Gastroscopy vs. Endoscopy - What's the difference? Esophagogastroduodenoscopy (), (EGD) also called by various other names, is a diagnostic endoscopic procedure that visualizes the upper part of the gastrointestinal tract down to the duodenum. It is considered a minimally invasive procedure since it does not require an incision into one of the major body cavities and does not require any significant recovery after the procedure (unless sedation or anesthesia has been used). However, a sore throat is common. An endoscopy (looking inside) is used in medicine to look inside the body. 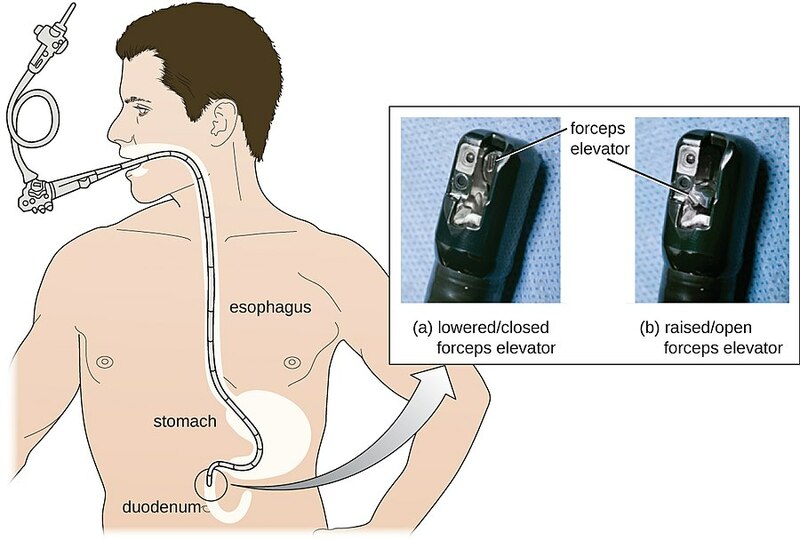 The endoscopy procedure uses an endoscope to examine the interior of a hollow organ or cavity of the body. Unlike many other medical imaging techniques, endoscopes are inserted directly into the organ. There are many types of endoscopes. Depending on the site in the body and type of procedure an endoscopy may be performed either by a doctor or a surgeon. A patient may be fully conscious or anaesthetised during the procedure. Most often the term endoscopy is used to refer to an examination of the upper part of the gastrointestinal tract, known as an esophagogastroduodenoscopy. For non-medical use, similar instruments are called borescopes. Examination of the abdomen or stomach, as with the gastroscope. The art or process of examination or treatment by means of an endoscope.